This bread is a dense dark and rich bread that is great for breakfast with lots of butter or cream cheese spread on thick toasted slices. 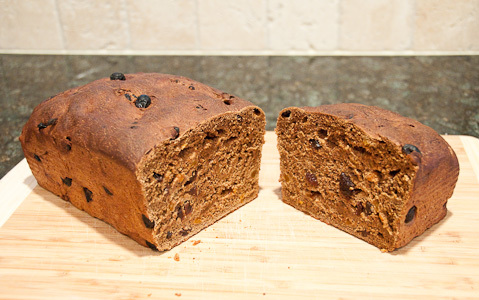 It can be made with raisins, dates, dried apricots, or whatever you might like. It does not contain a lot of sugar and I use black strap molasses, which is not that sweet. It makes for a hearty breakfast meal that will last until the afternoon lunch. In a cup, stir the sugar into lukewarm water and then sprinkle the yeast on top. Let it stand without stirring for about 8 to 10 minutes. To 2 cups of flour add the salt, butter (softened), molasses, beaten egg, and the warm milk. Mix a few minutes until the mixture is smooth with few lumps. Slowly add the remaining 2 cups of flour and knead the dough on the lowest setting for about 6 to 8 minutes total. After about 3 minutes of kneading, the raisins and chopped apricots can be added. The dough will be quite sticky and but should not be wet and sticking to the bowl - add a bit more flour if needed. Cover the dough and let it rest for an hour. Knead gently for a minute and transfer to a 5 by 9 inch greased medium bread pan. Cover with a towel and let it rise from 2 to 4 hours until it at least doubles in size. The time to rise varies with temperature and if it needs to sit for 5 hours, that is fine. Bake at 375 degrees F for 35 minutes. Cool on a wire rack. You can brush the top with melted butter to soften the top crust if you like. The bread keeps well although sometimes we cut the loaf in half and freeze it for later in the week. Regular molasses can be used but it is sweeter and with less flavor.